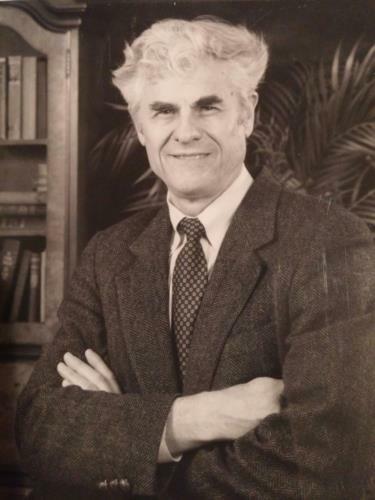 Miles Myers, former President of the California Federation of Teachers (CFT) and Executive Director of the National Council of Teachers of English, co-founder of the Bay Area Writing Project, author, high school English teacher, advocate for public education, and workers’ rights activist, died on December 15, 2015 at the age of 84. 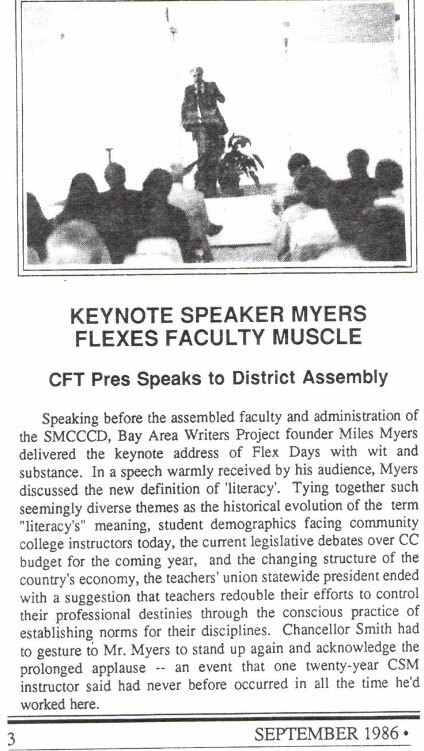 Some long-time SMCCCD faculty may remember his keynote speech at the 1986 District Flex day. Fred Glass, who was our Local 1493 staff person at the time and is now the CFT Communications Director, clearly recalled that event recently in a eulogy he gave for Miles. Following are Fred’s words and below right is the report of that Flex Day presentation from the September 1986 Advocate. Before Miles hired me as his communications director [of the CFT] I was working as the staffer for AFT Local 1493 representing faculty in the San Mateo Community College District. We had only recently won representation rights after a seesaw round of bargaining elections against the local CTA chapter, and our conservative district administration was deeply distrustful of the radical AFT. Somehow the committee that selected the keynote speaker for the all-employee meeting the first day back from summer chose Miles. When the Chancellor learned that the state president of the CFT was going to address his district he was not a happy camper. He tried, but failed to pull the plug. He made himself unpopular with even CTA chapter diehards who viewed his meddling as an assault on academic freedom. When the big day came I introduced Miles to the Chancellor. They shook hands, sat down together at the podium, and on went the show. I noticed the Chancellor was more pale than usual. But soon after Miles began to speak, you could see the Chancellor relaxing. Miles, far from Eugene V. Debs with horns, was talking about where standardized tests came from, how schooling changed as a result of World War I and the dawning understanding of the military that it need to figure out how to train illiterate soldiers fresh off the farm, and the history of literacy as it related to the mission of community colleges. The talk was learned, entertaining, wide-ranging, and quite successful. The AFT faculty gave him a standing ovation. Even some of the CTA stalwarts applauded. We signed up a bunch of new members. Afterward Miles told me when he shook the Chancellor’s hand at the beginning the man was sweating bullets, his hand cold and clammy. He told me this with a little smile that said he wasn’t entirely sorry about creating that feeling in an anti-union bully, but also with a real sympathy, maybe a little sadness, for the human dilemma that the Chancellor presented to him in that situation. I found it to be a consummate Miles moment.